For the most part we are still in doldrums, but it is possible to see the way out. It is hard to judge improvements in timeliness of book releases, but there are less fill-in issues and "guest" artists, which could be a testiment to Archie Goodwin's solidifying of the Editor-In-Chief role. Roger Stern and (Mary) Jo Duffy are promoted to full editor status. "...I wonder how many of you remember one of the prime goals we set for ourselves here at Marvel more than a decade ago. I recall writing that our greatest ambition was to change the image of so-called "comicbooks" - to take them from the exclusive domain of the bubble-gum brigade and expand our audience to include readers right up to college age - and beyond. Well, the rest of the media felt we'd never make it, while our competitors just laughed at us. No one thought we had a ghost of a chance to grab a significant share of adult readership. But here in the batty Bullpen we were probably too naive to realize how impossible it was. So, we just kept on writing and illustrating the very best stories we could, combining a university-level vocabulary with mature concepts in plotting and characterization, together with adult premises and rationalizations. 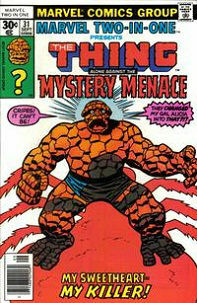 And, most important of all, we never let ourselves forget that, above all else, Marvel Comics are meant to be fun! No matter how scholarly, no matter how profound, no matter how philosophically or socially relevant our yarns might be, their primary purpose was (and still is) to entertain you. Finally, we vowed never to "write down" to you; we'd only present stories that we ourselves enjoyed; tales we ourselves would be anxious to read. So you see, we weren't merely producing pablum for a bunch of nameless, faceless kids - we were creating far-out, fantastic epics for ourselves, and for countless thousands of our hip, heroic readers who share the same love of fantasy and excitement as we do. And, y'know something? It worked! We succeeded beyond our own wildest expectations. Today, a full 50% of our readership is from 15 to 25 years of age!..." I bring this up because of recent claims by both fans and Marvel employees that the fact that the readership of Marvel today is largely older is a new situation, and a detriment to the industry. It is almost made to sound like that the fact that adults are the main readers of the books is some weird phenomenon and that the creators of old "knew" their primary target was children. In fact, it is clear from Stan's comments here and elsewhere that targeting an adult audience was always a major goal of the company. From this point on (and even for a while prior), Stan's Soapboxes become increasingly disconnected from what is going on in the mainstream Marvel books. He is always talking about some licensed product or movie deal, many of which never materialized. Which isn't to say that some of the licensing wasn't valuable. Marvel's Star Wars license, introduced in the July Bullpen, was basically the only thing that kept it afloat for a period when sales were otherwise not very good (Stan actually opposed that particular deal until Roy Thomas forced it through). Creator notes: Writing quality starts to improve a bit under Goodwin - largely due to the emergence of Chris Claremont, who is writing Iron Fist, X-Men, Ms. Marvel, and Marvel Team-Up, and takes over Power Man towards the end. 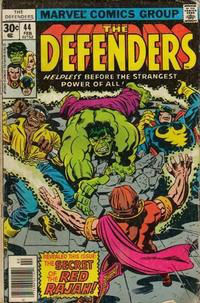 Jim Starlin writes a few issues of Dr. 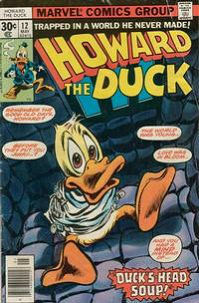 Strange but is quickly replaced by Roger Stern, in his earliest series. Jim Shooter subtly improves the Avengers. The Wolfman/Colan/Palmer Tomb of Dracula run is at its height at this time. Elsewhere, things aren't so great. John Byrne emerges as something of a savior on art, similar to the way Chris Claremont is almost single-handedly carrying the Marvel line from a writing perspective. He had been drawing Iron Fist, and he takes over the X-Men and Marvel Team-Up and does a great fill-in arc on the Avengers this year. Other than Byrne, there isn't a lot to recommend artwise this year. Starlin more or less stops drawing, and Paul Gulacy's run on Master of Kung Fu ends. 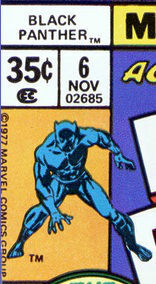 George Perez is absent for a decent percentage of his Avengers run. Notable events: Jim Starlin's Warlock epic concludes this year (and the entire story is placed here due to the nature of the reprints). Ms. Marvel, a blatant attempt to cash in on the feminist movement that becomes a good book in spite of itself (thanks to Chris Claremont), debuts. Spider-Woman also debuts, although she does not have a regular title to appear in at this time - my understanding is she was essentially created to protect a copyright. The X-Men go off into Shi'ar space for the first time. Nova #6-9 1st Sphinx. 1st Xandarian Worldmind. Uncanny X-Men #107-108 1st Imperial Guard (inc. Gladiator). 1st Starjammers.